Mmm… This explains a lot.. 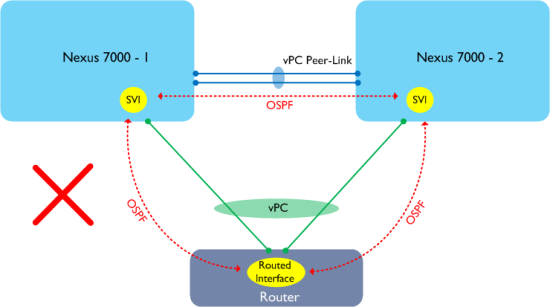 The lack of support for running layer 3 routing protocols over vPC on the Nexus 7000 is well documented – less well known however is that the Nexus 5500 platform operates in a slightly different way which does actually allow layer 3 routing over vPC for unicast traffic. Some recent testing and subsequent discussions with one of my colleagues on this topic reminded me that there is still (somewhat understandably) a degree of confusion around this. This entry was posted in Uncategorized on February 11, 2015 by Glen Kemp.